A couple that gets healthy together stays healthy together. 😊👍 We transformed together and have stayed transformed together. ***NOTE: The food changes wasn't for a goal to lose weight this last time... it was actually mainly to improve my health because I have a wonderful husband and four amazing kids to live with and enjoy life with abundantly daily! I had realized that it's my personal responsibility to take control of my health and with the knowledge gained, I knew better. sure there are genetics and some obstacles that are in our way but I fully believe and have personally experienced great changes and positive results of finding the right ingredients that heal and improve your body. 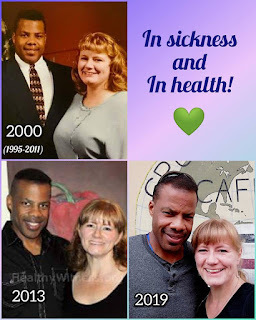 Today, I reflect on transformation Tuesday to smile and be glad that my husband has supported and been very much part of this journey in life, through sickness and in health. Truly being two that become one.